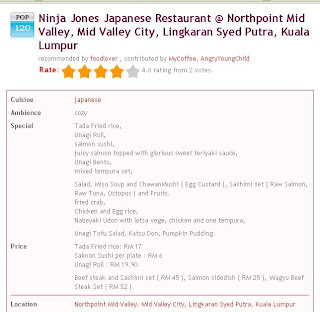 Whenever you are looking at a food venue, let’s say Ninja Jones at Mid Valley, wouldn’t it be nice if you could find other similar Japanese cuisine, or check out other restaurant at the same area? That is exactly what we are offering, Cuisine and Location linking. Look carefully at the maroon red information box at the top section, zoom to Cuisine and Location. 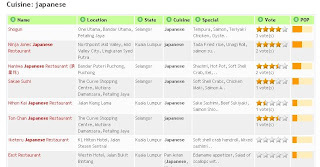 You could find that the words are actually a red link (which is clickable) and could show you more Japanese cuisines, or find other food venues in Kuala Lumpur, Mid Valley City or Northpoint Mid Valley. Isn’t that cool and useful? Anyway, you could Search for Malaysia Food by Location and Cusine.